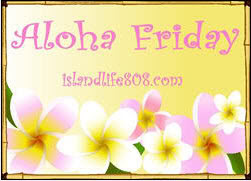 Aloha and Happy Friday. Hard to believe next Friday is Christmas! My question for you...Are you all shopped and wrapped and ready? Or, will you be like me...madly wrapping late on Christmas Eve? My goal is to finish the shopping today and tomorrow and then warp on Sunday - keep your fingers crossed for me. LOL! I'll be like you!! Madly wrapping on Christmas Eve!! I love it like that!! I was distracted by a death in the family so I'm behind and will probably wrap on Thursday. I'm all done already! Hooray! i have wrapped most everything i am just waiting for a few more gifts to come in and then I will be done, i have to do a little at a time otherwise nothing would get wrapped I am really not good at wrapping and don't enjoy it at all so i have to pace myself. Yup, shopped and wrapped. Now if I could only find time to deliver everything! Yup! lol. How did I miss you on Aloha Friday? Weird!